After our calamitous trip to Barcelona (Spain), Casablanca (Morocco), and the Canary Islands (islands off the western edge of the Sahara, territory of Spain) we wound up in Madrid-Barajas airport. 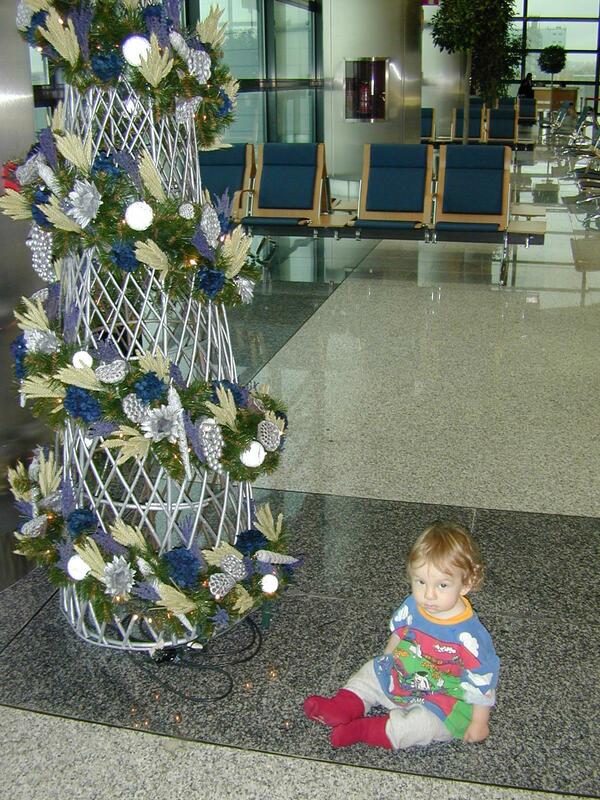 Isaac was still running at only seventy per cent, but he found enthusiasm for playing with the decorations on the airport faux Christmas trees. We were to fly for ten hours to Chicago O'Hare (but we circled for an additional two hours because the airport was oversubscribed and jammed even on a clear, dry day with magnificent visibility). Avoid O'Hare at all costs. 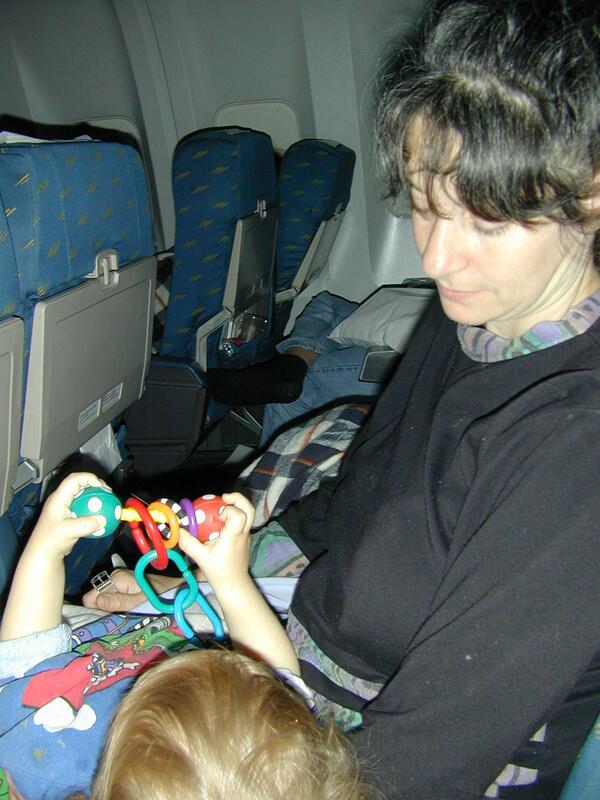 Flying with a child isn't much more difficult than any other time, but of course space is limited. One has to spend extra time inventing games to play. We pack a special bag of diversions just for the plane, but a one-year-old has a lot of energy and a yen to run. 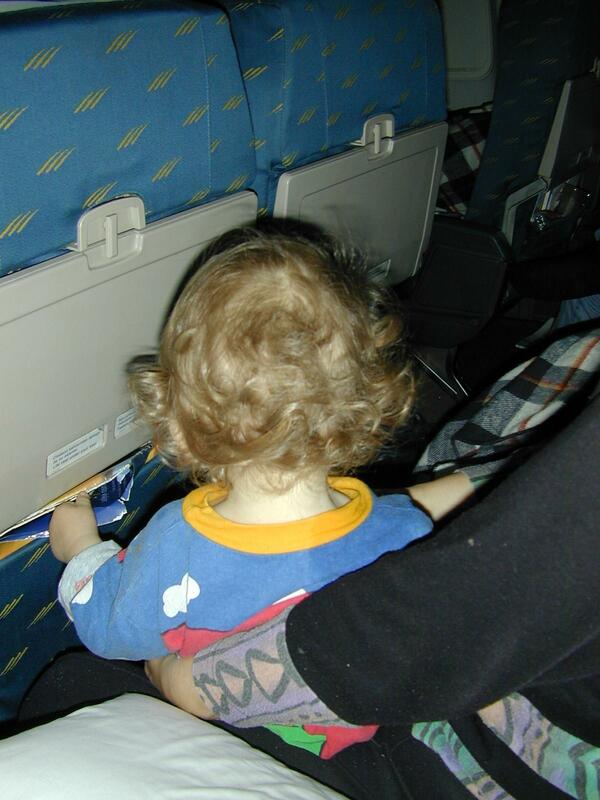 Isaac amused himself by nibbling through many airline bread rolls, running up and down the length of the plane (which is how he got his first scar), and making friends with all everyone seated along the aisles. Here you see him making friends with the family of a peer.